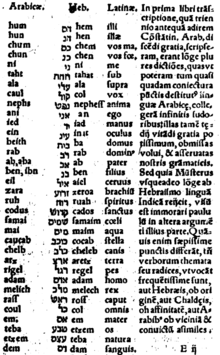 Although early Aramaic (pre-7th century BCE) had only 22 consonants in its alphabet, it apparently distinguished all of the original 29 Proto-Semitic phonemes, including *ḏ, *ṯ, *ṱ, *ś, *ṣ́, *ġ and *ḫ – although by Middle Aramaic times, these had all merged with other sounds. This conclusion is mainly based on the shifting representation of words etymologically containing these sounds; in early Aramaic writing, the first five are merged with z, š, ṣ, š, q, respectively, but later with d, t, ṭ, s, ʿ. (Also note that due to begadkefat spirantization, which occurred after this merger, OAm. t > ṯ and d > ḏ in some positions, so that PS *t,ṯ and *d, ḏ may be realized as either of t, ��� and d, ḏ respectively.) The sounds *ġ and *ḫ were always represented using the pharyngeal letters ʿ ḥ, but they are distinguished from the pharyngeals in the Demotic-script papyrus Amherst 63, written about 200 BCE. This suggests that these sounds, too, were distinguished in Old Aramaic language, but written using the same letters as they later merged with.